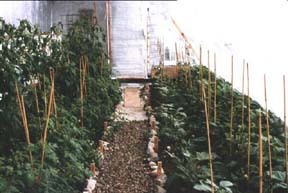 Unlike most greenhouses where plants are grown in containers or hydroponically, the passive solar greenhouse allows the gardener to plant directly into the ground. With two feet of insulated foundation, the soil stays warm enough to grow plants year round. first, get a good, comprehensive soil test. then add organic soil amendments/fertilizers as necessary. mix in the amendments, cake smooth, and you have prepared the beds for direct seeding and/or transplanting. Before the greenhouse was built, I had a full soil analysis done, including trace minerals. This crucial step of soil testing is one that many gardeners skip, but having an accurate baseline allows the gardener to add the proper nutrients in correct amounts. However, I recommend that you have your soil tested AFTER the greenhouse is built, since the building process itself disturbs, moves, and compacts soil. Also, I needed to import soil to level the beds inside, and it was different than the soil I had tested. Prior to either gardening or greenhouse building, the soil on that spot was a typical high desert soil: very powdery when dry, hard-packed, high alkaline clay with some sand. The nitrogen, organic matter, and iron content were all extremely low; phosphorus, potassium, and magnesium were too high. The pH was a whopping 8.0 (very different from the acidic Georgia red clay I gardened in prior to moving to New Mexico). Phosphorus: minimum of 60 ppm. Sodium: anything under 100 ppm. Each bed it 4 feet wide and 11 1/2 long. Each bed was further divided into four equal sections, alternating Azomite and control (no azomite). Each of the six sections of approximately 46 square feet received two pounds of a humic acid product, two pounds of gypsum, one pound of sulfur and one pound of worm castings. Each of the 12 azomite areas received 18.5 oz. of the rock dust. The Biodynamic beds were double dug, and Biodynamic Compound Preparation BC, #500, and #501(5x) were mixed in water and applied to the soil prior to planting. The lighter soil bed had two five gallon buckets, one of coir (ground up coconut hulls, a �new� substitute for mined peat moss) and one of perlite added to the bed to help �fluff up� the soil. Both the middle/control beds and the west/lighter soil beds were rototilled. Because the soil I added to the beds to raise the level inside the greenhouse was of a poorer quality, the plants did not do well the first month. I then added a total of 16 5 gallon buckets of finished compost to the entire planting area (eight in the front beds and eight in the rear beds). That worked.